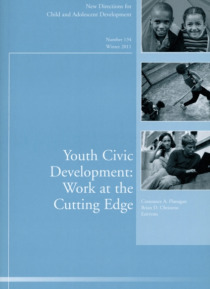 Take a cutting edge look at the civic engagement of young people. Increasingly recognized as an important feature of democratic functioning in communities, it has also become clear that the civic domain is indispensable as a context for understanding human development processes. This volume proposes the following central theses in relation to youth civic development: It is rooted in the realities… of young people s everyday lives. It is collectively constructed. It raises questions about the principles, values, and relationships that bind people together in societies. It raises questions about power and justice. Youth civic development pushes the field to focus on the social issues with which younger generations are grappling and the identities they are constructing issues that also are shaped by structural inequalities and by the collective actions of youth. The volume builds on themes of agency and assets from the field of positive youth development and points to ways that the critical analysis and engagement of young people in their society can contribute to social change. This is the 134th volume in this series. Its mission is to provide scientific and scholarly presentations on cutting edge issues and concepts in child and adolescent development. Each volume focuses on a specific new direction or research topic and is edited by experts on that topic.